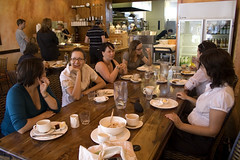 Yesterday the Perth Web Women got together for breakfast at the New Norcia Bakery in Mt Hawthorne. We had good coffee, a tasty breakfast and lots of excellent, geeky conversation. An excellent start to the day. 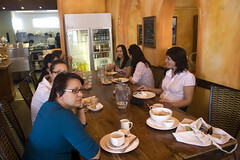 We’ve talked in the past about the different things a web women group can do, like mentoring for school age girls who are interested in technology careers and speaking at various events in a similar capacity, but one thing that I value from our networking sessions is the chance to share a coffee with like-minded women who are just as much at home talking about shopping for a pair of shoes as shopping for a new PDA. We have people coming along from all stages of life and career, and hearing from people who have families and careers and are doing just fine with that, thank you, is really an inspiration. 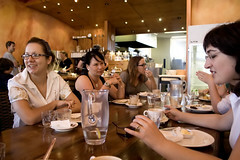 So a big thank you to Tania, Megs, Harriet, Helen, Kristy, Susanne, and Rosemary, as well as all the others who come along to Web Women Wednesday breakfasts or lunches – you gals rock! ~ by goatlady on January 18, 2007. I didn’t notice you snapping away at the other end of the table! I really enjoyed our first get together of the year. Thanks Kay!